Unique Star Review 2019: Is Unique Star a Good Hosting? Hosting provider Unique Star enjoys some positive reviews on social media, and its plans include all the expected elements. Unique Star has offices in the U.K., Saudi Arabia, and Pakistan. Its Facebook page is inactive, but it has some positive social media reviews. Its crisp, clean website is available in English. There are five tiers of shared hosting plans: Personal, Basic, Pro, Advanced, and Premium. The Personal plan has limited features, so unless you need a basic plan with less than 100 MB disk space, you will need to upgrade to one of the four higher packages. New website owners get some useful tools to help them get started quickly. There is a one-click installer for WordPress, phpBB, and various CMS programs (but I can’t tell you which ones). There is also a live chat script installer and a generic one-click script installer. Plans come with the popular cPanel control panel, and you get an industry-standard 99.9% uptime. Unique Star’s prices are in line with other companies. The higher tier plans – which come with unlimited disk space, bandwidth, and domains – are at the higher end of the price spectrum. However, if you can make do with fewer than four domains, you could pick up a cheap plan with all of the same features. You can purchase plans on terms ranging from one month to three years, and you pay less when you commit more. Domain names come free with some plans (but not all), but backups and SSL certificates always cost extra, so that’s something for you to keep in mind when considering a purchase. 24/7 customer support can be accessed by phone, live chat, and email. There is no knowledge base (unless it’s hidden behind a login page) or FAQs, which means you’re reliant on the quality of the technical support staff. Unfortunately, when I attempted to contact the company in the early morning (U.K. time) by email and live chat (which was offline at the time), I had still received no response two days later. Unique Star has enjoyed positive reviews on social media and independent review sites. Whilst I couldn’t find any stand-out features from this provider, all the expected elements are there along with support for some advanced programming languages. 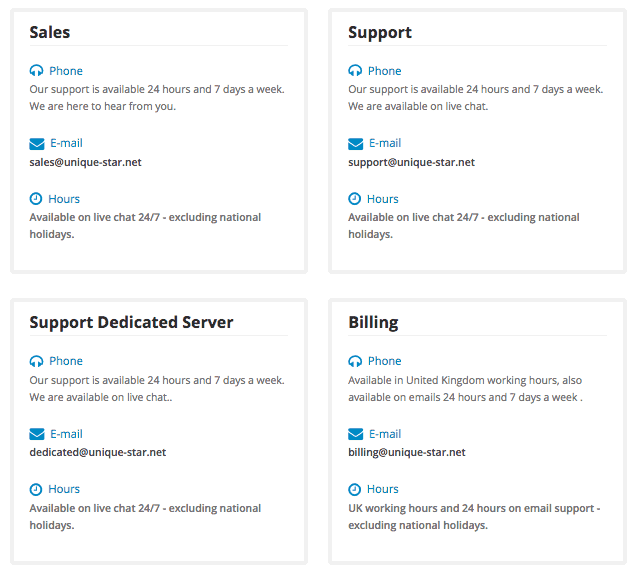 Wondering how Unique Star stacks up against other Web Hosting companies? Enter any other Web Hosting company and we will give you a side-by-side comparison.